(c) (p) 2017, Joe Jencks, Turtle Bear Music, ASCAP - except where otherwise noted. "Beyond the fine selection of songs and the talented team assembled in the studio, what really shines through on Joe Jencks' new album are his resonant, honey-rich voice, his open-hearted humanity, and his commitment to social justice. We need artists who inspire our better selves more than ever, don't we?" 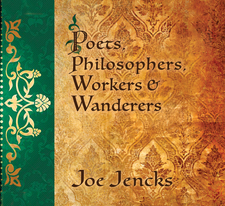 "Poets, Philosophers, Workers & Wanderers is an emotional powerhouse. Joe Jencks provides us with much needed inspiration and hope and reminds us what "love" is really all about." "Joe Jencks has created an exquisite musical journey, using his insightful writing as a vehicle and his extraordinary voice as the guide. The songs touch on a variety of poignant topics, and they're expertly arranged, allowing listeners to get the full effect. Truly a work of the heart."